To me, nothing says dessert like cheesecake. 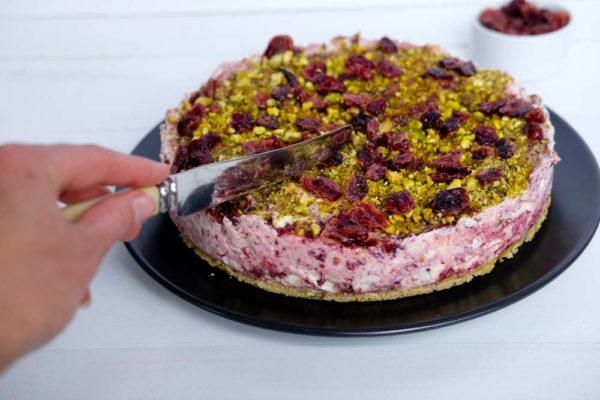 And for the festive season, this cranberry and pistachio cheesecake makes the perfect dessert option with it’s green and red colour combination (well, it’s more pink but close enough…). When it comes to ‘healthier’ sweet treats my rule of thumb is it must also taste delicious, otherwise what’s the point? Food is for both nourishment and enjoyment! This cheesecake makes a few switches from the standard recipe and the result is something that is just as delicious as other cheesecakes. Instead of a biscuit base I’ve used a combination of nuts, oats and coconut and in my opinion it tastes even better than a biscuit version, but you could still use a standard biscuit base if you prefer. The filling is a combination of yoghurt and cream cheese as well as sweet, tangy cranberries which makes it a little less rich than a traditional cheesecake, yet still very delicious. Sweet dried cranberries teamed with crunchy pistachio nuts add a festive topping that tastes delicious too. In a blender or food processor, add the pistachio nuts and blend until very finely chopped. Add the oats and blend again until they are also finely chopped. Add the almonds, chopped dates, vanilla and coconut oil and blend until mixed. You may need to stop the blender and give it a quick mix by hand a few times to help it all bind together. Line the bottom of a spring lock 20cm cake tin with baking paper. Press the base mixture firmly into the bottom with clean hands and place in the fridge while you make the filling. Take the cream cheese out of the fridge and leave to soften (or microwave for 20 seconds in a bowl). Mix together with the yoghurt, vanilla and honey and beat until well combined and creamy. Dissolve the gelatine with the water, add to the mixture and beat quickly to combine. Place the cranberries and water in a blender and blend until the berries are very finely chopped. Fold through the yoghurt/cream cheese mixture. Pour the filling on top of the base and smooth with a spatula. Blend the remaining cranberries and water and place on top. Finely chop the pistachio nuts and add to the cheesecake topping and add another sprinkle of cranberries on top. Place in the freezer to set for 3-4 hours. Enjoy the Cranberry and Pistachio Cheesecake! I love Chelsea Winter’s White Choc and Cranberry slice that has pistachios and macadamias in it. I enjoy Chelsea Winters munch muesli bar receipt which is full of nutty goodness and also seeds. My favourite dish involving nuts is vanilla cashew chia pudding. Ginger slice with a cashew cream icing ? We use nuts in almost every meal we have! Bit one of my very favourite ways to use them is in a Moroccan chicken salad with Israeli couscous and honeyed apricots, avocado, baby spinach, red onion, sliced strawberries and pomegranates with beautiful pistachios and toasted almonds topped with a garlicky yoghurt dressing and lots of coriander. Dukkah is a favourite, and toasting a range of nuts and seeds to add a crunchy delicious topping to my salads.. No recipe, just what I have in stock! I absolutely love peanuts, pistachios, Brazil nuts and cashews in particular and my fave nut recipe is last Christmas’ dessert of a raw cashew, cacao and raspberry torte! I love two cups of nuts and seeds toasted, then stirred into melted dark chocolate. Spoon little clusters onto baking paper then let them cool. Great healthyish snacks to satisfy a craving – usually around mid-afternoon ? 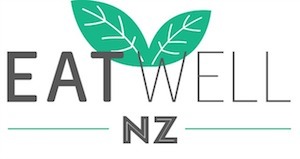 Wow – this looks amazing. We are using fresh life walnuts in the Bircher muesli that we make every morning using your recipe. It’s delicious! My favourite nut recipe would have to be my morning muesli, would be lost without it! I use a mixture of almonds, cashews, Brazil nuts and walnuts thrown together with whole grain oats + seeds and mixed together with a drop of Manuka honey and coconut oil before roasting – delish! I also make an Xmas version where I swap the walnuts for pecans and add in cranberries, pistachios and freeze dried raspberries. I love making nutty bliss balls with dates, cashews, almonds and coconut. They taste amazing and give me a much needed burst of energy when I’m at work!! Definitely my homemade nut mylk!! So simple and so much better than store bought! I use nuts to make sauces, usually for pasta. Our favourite is a creamy tomato pasta made from cashews, from oh she glows. Amazing! We love macadamia crusted chicken- delicious. It would have to be Nadia Lim’s mandarin cake- made with whole mandarins and ground almonds- gluten free and so delicious :). Any kind of nuts with dates, coconut oil, freeze dried strawberries and vanilla protein powder whizzed up and rolled into bliss balls, yum! Love using nuts in salads, one of my favs is green beans, lemin zest,feta and roasted almonds. It’s so hard to choose a favourite- creamy homemade almond butter, decadent choc chip cookies loaded with macadamias, or salads studded with freshly toasted walnuts. Delicious! Hazelnut dukkah is my fave! I love to make an Orzo salad with turmeric roasted carrots and toasted pinenuts – it’s a regular dish at our Christmas dinner every year! Maybe favourite but recipes have to be hazelnut truffles or homemade museli with a selection of nuts. Cashew based lemon cheesecake ?? 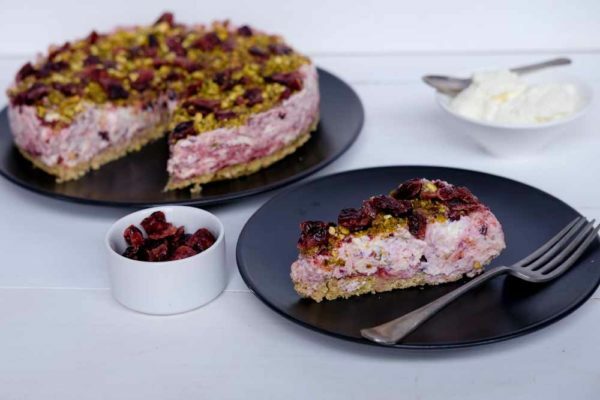 Cranberry Pistachio Cheesecake sounds divine, on my Xmas menu plan for sure. My favourite “recipe” is good old homemade almond butter or cashew butter – natural almonds or cashew in the food processor, with a pinch of salt, until it comes together as a nice smooth spread. 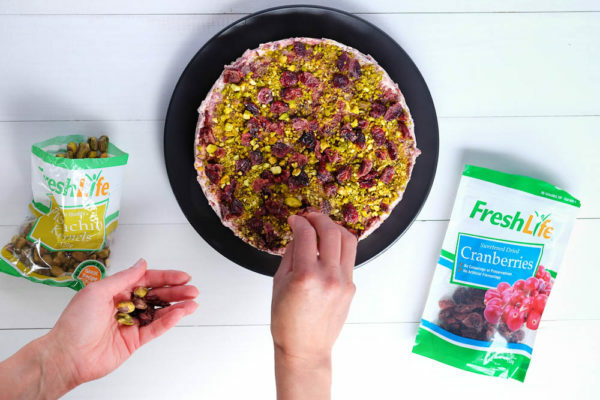 I have FreshlLife dried cranberries in my pantry currently for that slice, and am intending to make some lactation cookies with them and some dark choc chunks added, so more definitely wouldn’t go astray! ? Hazelnut almond & cranberry slice! I love making home made muesli bars or some home made granola ?? Love my Nanas White Chocolate, dried Cranberries, pistachio nuts and slithered almond slice. No bake needed – an extra bonus ! It’s to Devine to resist, and always a Christmas time favourite ? Can’t wait to make it again this season !